Both luxury hotel and apartment tower, "The Sherry" is more than these. It was built as the perfect luxury Manhattan pied-à-terre—and it still is. The 38-story Sherry Netherland building was the fourth tallest in New York City when it was built (1927). 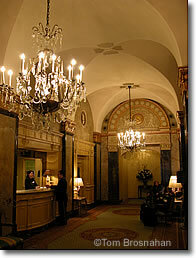 Most of it is filled with 97 choice, lavish apartments that benefit from The Sherry's services. And service was the point: you could live in Manhattan for a day, a week, a month or a year, and enjoy all the comfort of a luxury suite along with all the services of a superb European-style deluxe hotel: "the comfort of a private house with the freedom of a hotel suite," as one 1927 advertisement for the hotel put it. This makes it easier for the staff to do what they do best: provide superb personal service. Its location couldn't be better: on Fifth Avenue at 59th Street (map), looking west across Grand Army Plaza to Central Park, it's opposite The Plaza Hotel at the very center of Fifth Avenue shopping, a short walk to Midtown and a short ride to the Theater District and New York's great museums. Here's what it's like to get away to a Broadway theater weekend at The Sherry. on Fifth Avenue facing Central Park.